Taps and dies are specific tools that are used in threading that refers to the creation of threads around screws. There are several cutting and forming tools involved in the procedure. Taps are essentially used to cut or create the female part of the pair, whereas a die is generally used to form the male part of the pair, for instance, taps are used to form the nut whereas dies are used to form a bolt. Tapping is the term that refers to the process formation of threads or cutting while the term threading is associated with dies. The global market for taps and dies is expected to grow at a listless rate in the coming years. Transparency Market Research in its recent research report on global taps and dies market has covered several scenarios associated with the growth of the market which associated with the adoption of taps and dies across various applications around the globe. 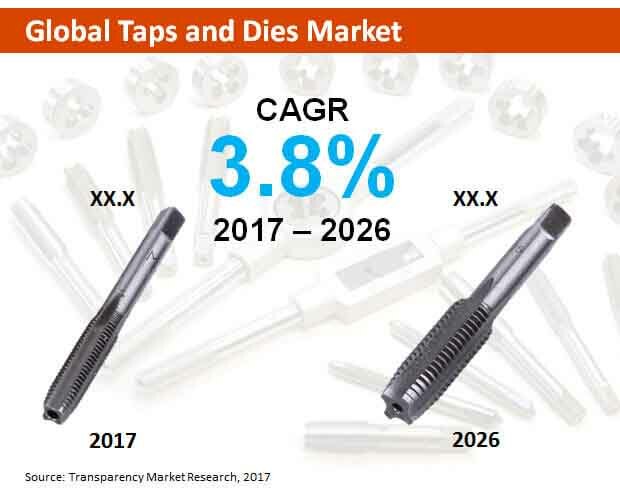 Various aspects such as trends, key developments, growth drivers, restraints and challenges associated with the taps and dies market are covered in this extensive research report. Moreover, the research report covers historical analysis of the global taps and dies market along with current market scenario as well as future market projections of the global market which is carried out for a period of nine years, starting from 2017 till 2026. According to this analytical research study, the global market for taps and dies is expected to grow at a sluggish CAGR to reach a market estimation of over US$ 2.3 Bn by the end of the year of assessment from a value of around US$ 1700 Mn in 2017. Europe has been a lucrative region for the growth of the taps and dies market since 2012. The use of taps and dies in Europe has been growing since the 2012-2016 timeline and is expected to reach a higher valuation by the end of the year of assessment. Moreover, the European market is expected to be the largest and the region is expected to dominate the global taps and dies market in the coming years. The growth of taps and dies market in Europe is mainly pushed by increasing adoption of taps and dies across industrial and household sectors in the region, especially in European countries such as Germany, United Kingdom and France. Of these, Germany is the largest contributor for growth of the taps and dies market in Europe and the market in Germany is estimated to reach a valuation higher than US$ 200 Mn by the end of the year of assessment, whereas on the other hand, there is cut throat competition in taps and dies market in UK and France. Asia Pacific excluding Japan (APEJ) region is the fastest growing that is expected to showcase increasing adoption of taps and dies owing to increasing household purposes and industrial projects in the region. North America is anticipated to be the second largest region with US being the main growth contributor in the region. Taps and dies are widely used in household and industrial sectors across the globe. Of these the industrial application segment is expected to be the largest with a high market valuation and is anticipated to lead the global market for taps and dies. Also, this segment is projected to grow at a relatively high rate throughout the period of assessment, 2017-2026. The informative research report on global taps and dies market covers analysis of various key players involved in the market. Aspects such as company overview, key financial aspects, product portfolio, developments and strategies of the key players have been covered thus offering a complete intelligence package. Major players such as Kennametal, Cleveland, Triump Twist Drill, Titex Tools, Guhring, Chicago Latrobe, OSG, Michigan Drill, Accupro, M.A. Ford, Atrax and Kyocera have been profiled in this research report. The report on global taps and dies market reflects the current market scenario along with future market projections for a period of five years. The base year considered in this research is 2017 and the forecasted year is 2022. Various political, economic, social and technological factors that have an influence on the growth of the global market and are likely to impact the demand for taps and dies are covered in this detailed research study. The macroeconomic aspects, trends, drivers and restraints are analyzed across important regions in the globe. Additionally, intelligence on key players dealing with taps and dies is given in this research study. Their details such as key strategies, SWOT, organization overview, market share, financials, developments and product portfolios are covered in a separate section on competitive landscape. The research study on global taps and dies market starts with an executive summary followed by global market overview. This section contains market introduction, definition of the market, market segmentation, global industry analysis and forecast for a period of five years, dynamics that have an impact on the growth of the global market, supply chain analysis, pricing analysis, raw material sourcing strategies and their analysis, cost structure, list of vendors and market presence of key participants (intensity map) as per region. Following this section, a detailed analysis on various market segments for the 2017-2022 period are assessed and their scenario in various geographies across the globe is covered. The global taps and dies market is segmented in-depth to analyze the actual picture of the global market. It is segmented by product type, by application, by distribution channel and by region. Transparency Market Research applies an exquisite research methodology to garner relevant insights. This research methodology is a blend of primary and secondary research. Secondary research is initially carried out to obtain a wide market understanding. The numbers obtained from secondary research are cross verified through primary interviews. Each data point obtained in one primary interview is validated in the next and the process continues till the conclusion of the market research. This reinforces the credibility of the researched data by enhancing its accuracy percentage. With the help of triangulation method, a single data point representing a particular segment in a particular region along with global statistics are obtained which reflects highest accuracy and can be used to make informed decisions. The research report puts forth an unbiased holistic market approach with which the reader is able to glean essential market acumen and a real market picture. The research study offers actionable insights that can be used to gain competitive advantage and maintain strong hold in the market. The study includes numerous tables and graphs that cover detailed market segmentation across important regions. The year on year market growth along with BPS analysis is also covered in this research report. Future market insights and expert recommendations are also included in this research, thus assisting the reader in every possible angle to meet his/her research objectives. 24x7 analyst support guaranteed to deal with queries if any.